This entry was posted in magazines news and tagged MINI Roadster reviews on May 19, 2012 by James Day. It’s not often that Roundel, a BMW magazine, puts anything other than a BMW car on its cover, but it did just that for its May 2012 issue. The cover car is a MINI Cooper S Roadster which is reviewed inside. So it seems the author, a BMW guy, is reluctant to admit he loves the MINI. He’s shown on the cover with a huge grin and even feels the need to explain that in his column on page 7. So what’s in store for you in this kiddie car, Mister Adult With Responsibilities And Good Sense? Well, first of all, it’s an excellent way to banish that image. As a roadster-with-a-lowercase-r fanatic myself, I must note the verities of the breed. Your neighbors will shake their heads as you drift out of the driveway on your way to work, tsk-tsking your apparent descent into a long-delayed adolescence while they inwardly seethe with envy. […] The Mini Roadster is simply so much fun that you might justify buying one even if you have no children, just in case. One positive comment on the article is that it does give several great tables of specifications and data on all the versions of the MINI Roadster, both manual and automatic. We can’t help thinking this article says more about the author and the typical BMW owner than it does about the character of the car itself. However much they might want to like the Roadster, the perception of their image by others comes first. Most MINI enthusiasts don’t suffer from this issue but will simply embrace the quirks and enjoy the sheer driving fun that Roadster and all MINIs provide. To read this issue, go to the Roundel reader page, click the Issues tab on the left side, and choose the May 2012 cover. 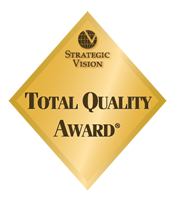 Note: the website uses Flash and will not work on Apple devices. This entry was posted in ads collectibles and tagged apps MINI Roadster on April 30, 2012 by James Day. Want to take a peek behind the curtain? Download the free Zappar app from your app store. Select the MINI tile at the top of your screen and tap “download.” Then hold your phone over the curtain. And enjoy the show. To finish our series of MINI Roadster prints ads, we saved the best for last. Following on from the MINI Roadster “Peep Show” video, we have a similar print ad that features augmented reality video. Using your mobile smartphone with the Zappar app installed, view the print ad and watch it come to life. If you don’t want to look for the Wired issue, download and print the PDF (full-page (7.5 MB) or reduced-size (415 kB)). This entry was posted in ads collectibles and tagged MINI Roadster on April 30, 2012 by James Day. The new two-seater MINI John Cooper Works Roadster can’t help but turn heads. With a turbocharged, direct-injected 208 horsepower engine and a six-speed transmission, it’s open-air motoring unlike anything else. Hit 50 MPH and the rear spoiler automatically lifts for better downforce, so you can leave onlookers behind. THE NEW MINI ROADSTER. HOLD ON. 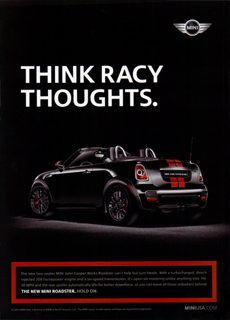 We previously featured this MINI JCW Roadster print ad, but here we have a slightly reworded version. So you completists collecting MINI ads will want to pick up this one, as well. This print ad can be found on page 112 of the May 2012 issue of Wired. Although there is one more MINI Roadster print ad that is interactive, here is the existing collection of MINI Roadster ads that we have seen so far. We have one for the Cooper, Cooper S, and John Cooper Works Roadster. The two-seater MINI Cooper S Roadster can’t help but turn heads. With a turbocharged and direct-injected 181-horsepower engine and 35 MPG, it’s open-air motoring unlike anything else. Hit 50 MPH and the rear spoiler automatically lifts for better downforce, so you can leave all those onlookers behind. THE NEW MINI ROADSTER. HOLD ON. 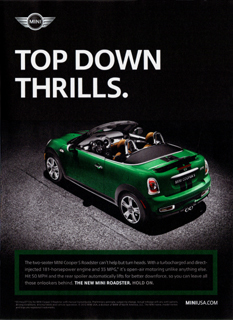 This print ad featuring a British Racing Green MINI Cooper S Roadster can be found in the current edition of The MINI International, vol. 37, #1/2012.